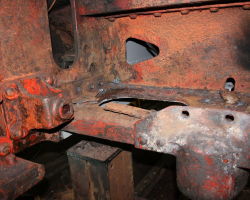 The crack in the RH frame to the left of the centre axle box has been known about and repaired in the past. 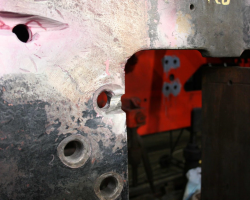 The picture shows where Brian has ground out the frame to its full thickness as shown by the red crack detection spray running upwards on the left. This is where he has reached the frame stretcher on the other side of the frame. 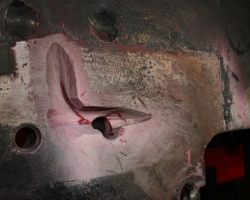 To the right of the hole can be seen evidence of the earlier crack that needs further grinding before welding repairs can be carried out. 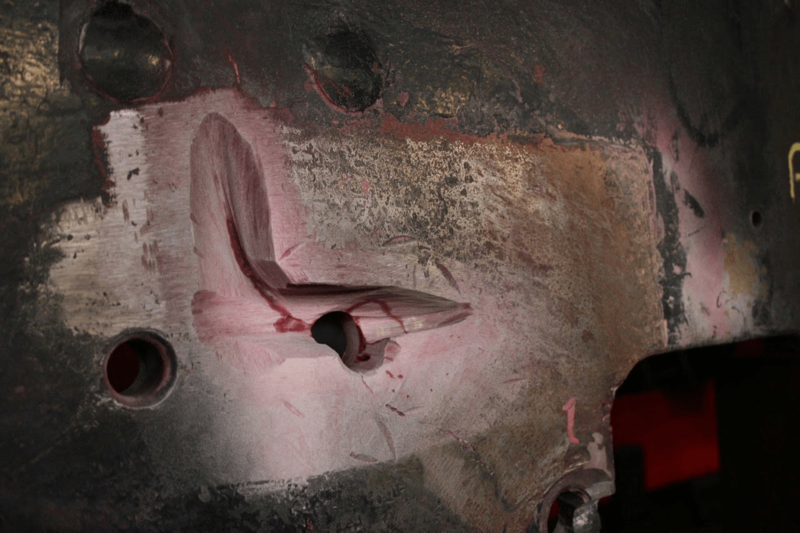 What appears to be a crack running diagonally down to the right is simply the line of the previous welded repair. 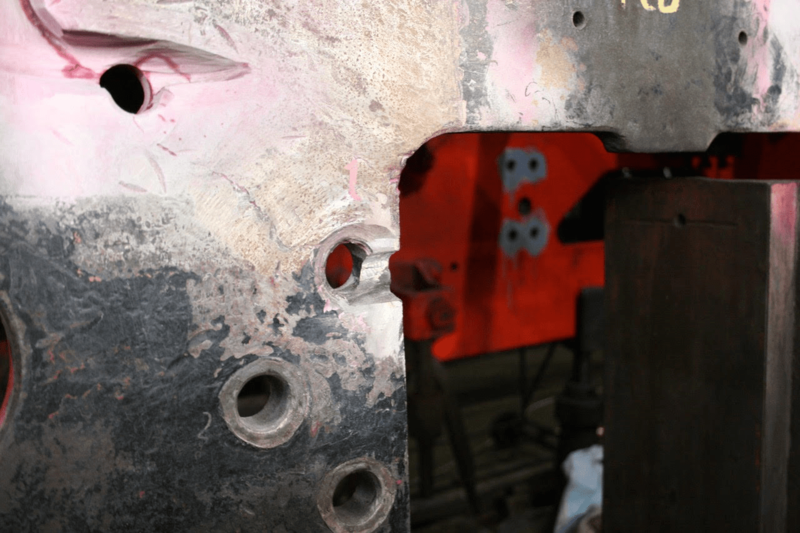 This shot of much the same area focusses on the hole at the edge of the axle box hole. Here the crack extends through the full frame thickness and can just be seen as a thin horizontal line in the middle of the ground out area. 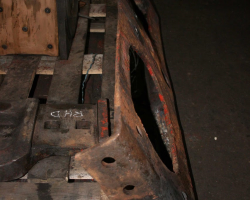 This will be have a welded repair on the outside after which the area will be ground out on the inside of the frame and a similar welded repair carried out. 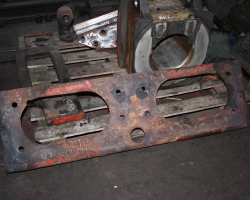 This is the frame stretcher to the rear of the cylinders consisting of vertical and horizontal components. 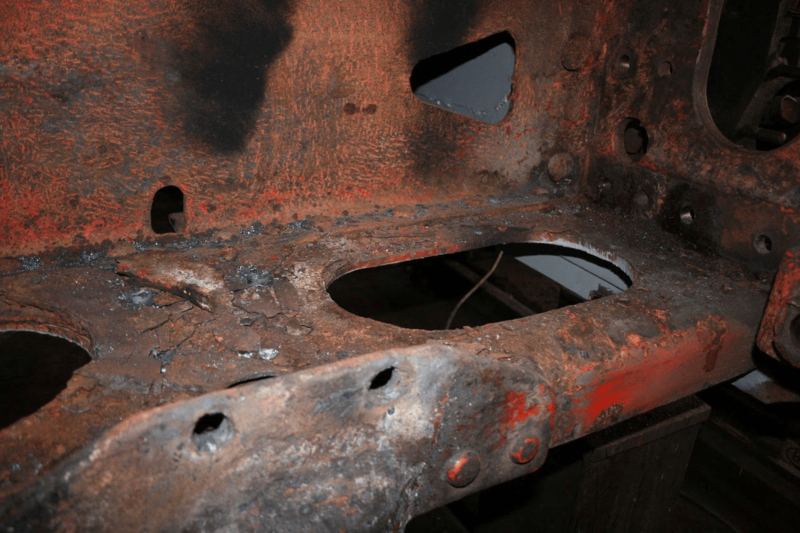 The casting in the middle is the pivot for the pony truck’s “reins”. 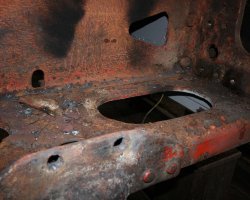 There was a second plate fitted above this one and the lumps of rust that were between the two are evident to the left. 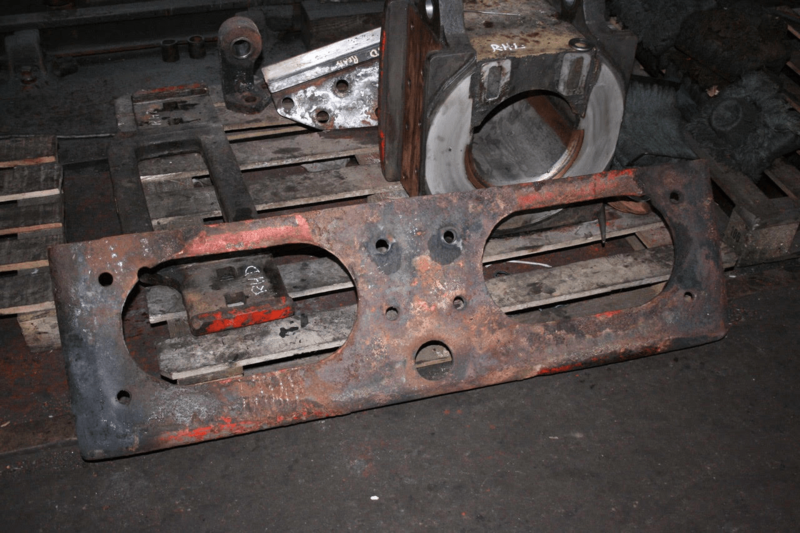 This plate, once cleaned up, will probably be kept whilst a new upper plate will be fabricated and riveted in place. 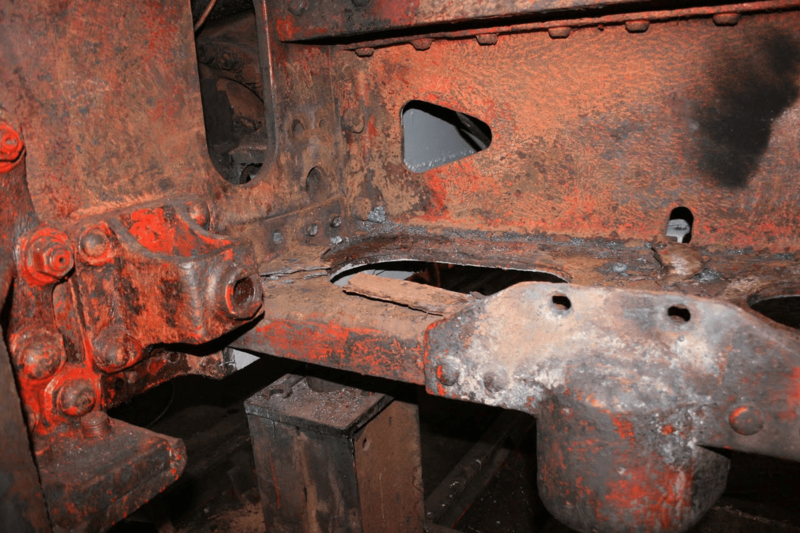 A further picture of the rust on the remains plate. The top plate shortly after removal showing the underside - it looks quite good but has wasted from around 13mm thick to 6mm or so in places. 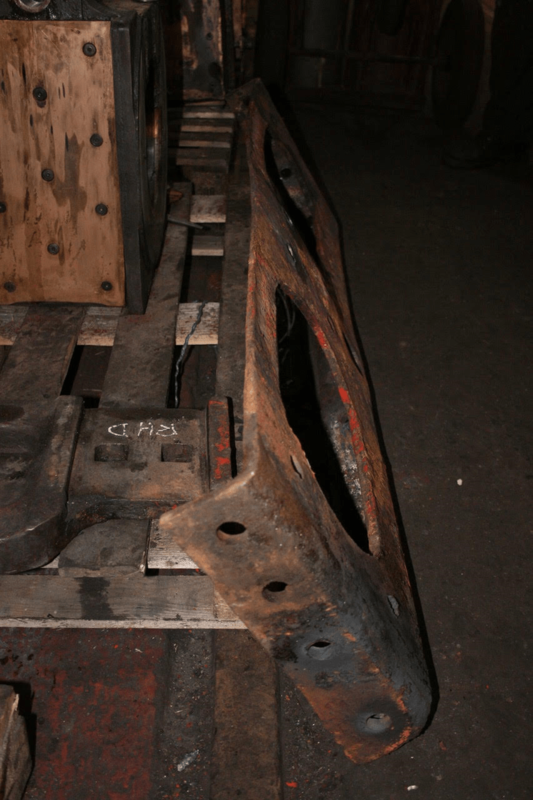 From this end view the wasting and bending of the top plate is more evident.